For a number of years now, an increasing number of synthetic nanoparticles have been manufactured and incorporated into various products, such as cosmetics. For the first time, a research project at the Technical University of Munich and the Bavarian Ministry of the Environment provides reliable findings on their presence in water bodies. Nanoparticles can improve the properties of materials and products. That is the reason why an increasing number of nanoparticles have been manufactured over the past several years. The worldwide consumption of silver nanoparticles is currently estimated at over 300 metric tons. These nanoparticles have the positive effect of killing bacteria and viruses. Products that are coated with these particles include refrigerators and surgical instruments. Silver nanoparticles can even be found in sportswear. This is because the silver particles can prevent the smell of sweat by killing the bacteria that cause it. Previously, it was unknown whether and in what concentration these nanoparticles enter the environment and e.g. enter bodies of water. If they do, this poses a problem. That is because the silver nanoparticles are toxic to numerous aquatic organisms, and can upset sensitive ecological balances. In the past, however, nanoparticles have not been easy to detect. That is because they measure only 1 to 100 nanometers across – a nanometer is a millionth of a millimeter. "In order to know if a toxicological hazard exists, we need to know how many of these particles enter the environment, and in particular bodies of water", explains Michael Schuster, Professor for Analytical Chemistry at the TU Munich. This was an analytical challenge for the researchers charged with solving the problem on behalf of the Bavarian Ministry of the Environment. In order to overcome this issue, they used a well-known principle that utilizes the effect of surfactants to separate and concentrate the particles. "Surfactants are also found in washing and cleaning detergents", explains Schuster. "Basically, what they do is envelop grease and dirt particles in what are called micelles, making it possible for them to float in water." One side of the surfactant is water-soluble, the other fat-soluble. The fat-soluble ends collect around non-polar, non-water soluble compounds such as grease or around particles, and "trap" them in a micelle. The water-soluble, polar ends of the surfactants, on the other hand, point towards the water molecules, allowing the microscopically small micelle to float in water. The researchers applied this principle to the nanoparticles. "When the micelles surrounding the particles are warmed slightly, they start to clump", explains Schuster. This turns the water cloudy. Using a centrifuge, the surfactants and the nanoparticles trapped in them can then be separated from the water. This procedure is called cloud point extraction. The researchers then use the surfactants that have been separated out in this manner – which contain the particles in an unmodified, but highly concentrated form – to measure how many silver nanoparticles are present. To do this, they use a highly sensitive atomic spectrometer configured to only detect silver. In this manner, concentrations in a range of less than one nanogram per liter can be detected. To put this in perspective, this would be like detecting a box of sugar cubes that had dissolved in the Walchensee lake. With the help of this analysis procedure, it is possible to gain new insight into the concentration of nanoparticles in drinking and waste water, sewage sludge, rivers, and lakes. In Bavaria, the measurements yielded good news: The concentrations measured in the water bodies were extremely low. In was only in four of the 13 Upper Bavarian lakes examined that the concentration even exceeded the minimum detection limit of 0.2 nanograms per liter. No measured value exceeded 1.3 nanograms per liter. So far, no permissible values have been established for silver nanoparticles. 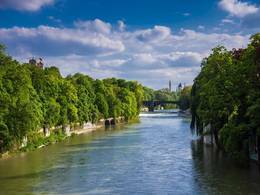 Representative for watercourses, the Isar river was examined from its source to its mouth at around 30 locations. The concentration of silver nanoparticles was also measured in the inflow and outflow of sewage treatment plants. The findings showed that at least 94 percent of silver nanoparticles are filtered out by the sewage treatment plants.